This article is about Chiayi City. For the county, see Chiayi County. Chiayi (Hokkien POJ: Ka-gī; Chinese: 嘉義), officially known as Chiayi City, is a city located in the plains of southwestern Taiwan. Formerly called Kagee during the late Qing dynasty and Kagi during the Japanese era (Chinese and Japanese: 嘉義), its historical name is Tirosen. First inhabited by the Hoanya aborigines, the region was named Tirosen (variants Tirocen, Tiracen). With the arrival of Han Chinese immigrants in southwestern Taiwan, the name evolved to become Tsulosan (Chinese: 諸羅山; pinyin: Zhūluóshān; Pe̍h-ōe-jī: Chu-lô-san) in Hokkien. Eventually, Tsulosan was shortened to simply Tsulo. Because of the choice of the characters, it has been mistakenly suggested that the origin of the name came from the expression "mountains surrounding the east". "Peach City" is another name for Chiayi City due to its peach-shaped territory in ancient times. The tip of the peach is around Central Fountain and was called "Peach-tip" by citizens. Tsulosan was once the foothold to which people from the mainland immigrated. In 1621, Chinese Peter [zh], who came from Zhangzhou, Fujian Province, first led his people to cultivate this land after they landed at Ponkan (modern-day Beigang). Records from the Dutch era show Tirosen as the usual form of the name; it also occurred as Tirassen, Tirozen, Tilocen, Tilossen, Tilocen, and Thilocen. The place was north of Mattau (modern-day Madou, Tainan) and south of Favorlang (Huwei, Yunlin). In 1661 (the 15th year of Yung-Li, Ming dynasty), Koxinga defeated the Dutch based in Taiwan and founded the Kingdom of Tungning. He established one province, Cheng-Tien-Fu [zh], and two counties, Tien-Hsing [zh] and Wan-Nien [zh], demarcated by the Hsin-Kang River (Chinese: 新港溪, now the Yanshui River). Chiayi was under the jurisdiction of the Tien-Hsing County. In 1683, when Qing rule began, the island was governed as Taiwan Prefecture under the administration of Fujian Province. In 1684, Tsulo County was established and initially encompassed the underdeveloped northern two-thirds of Taiwan. (Taiwan and Hongsoa counties were divided from Wan-Nien County during the Kingdom of Tungning, which was changed from Tien-Hsing County.) In 1704, the county seat was moved to Tsulosan, the site of modern-day Chiayi City, and had wooden city walls. In 1727, the county magistrate, Liu Liang-Bi rebuilt the gatehouses and set a gun platform for each gatehouse. The four gatehouses were named: "Chin Shan" (襟山) for East, "Tai Hai" (帶海) for West, "Chung Yang" (崇陽) for South, and "Kung Chen" (拱辰) for North. In 1734 (the 12th year of Yongzheng), magistrate Lu-Hung built piercing-bamboo to better protect the city. In 1786, the Lin Shuangwen rebellion was an attempt to siege Tsulosan but failed to overcome the defense of the inhabitants. Consequently, on November 3 of the next year, the Qing Emperor conferred the name Kagee (嘉義; literally: 'commended righteousness') to praise the citizens' loyalty. In 1887, a separate Taiwan Province was declared and the island was administratively divided into four prefectures; the city of Kagee belonged to Tainan Prefecture. In 1895, Taiwan was ceded to Japan in the Treaty of Shimonoseki. The 1906 Meishan earthquake devastated the entire city wall except the Eastern Gate. The Japanese authorities reconstructed the city. Industries and trades started to flourish. According to the census taken in 1904, Kagi was the fourth most populous city in Taiwan, with a population of over twenty thousand. In 1907, the construction of Alishan Forest Railway to Mount Ali was begun. In 1920, the city became an autonomous group as Kagi Town (嘉義街), Kagi District, within Tainan Prefecture, which included modern-day Tainan City, Chiayi County and Yunlin County. In 1930, the town was upgraded to an autonomous city under the same prefecture. In 1945, when Japan relinquished control of Taiwan on 25 October 1945, Chiayi City was established as a provincial city of Taiwan Province. On 16 August 1950, because of the re-allocation of administrative areas in which Taiwan was divided into 16 counties, five provincial cities and a special bureau, Chiayi City was downgraded to a county-controlled city and merged with Chiayi County to be the county seat. As a result, a shortage of capital hindered its development. On 1 July 1982, Chiayi City was elevated again to a provincial city as a result of pressure from local elites. On 6 October 1990, the East District and West District were established. Chiayi City is located on the north side of Chianan Plain, south west of Taiwan Island. On the east side is the Mount Ali, on the west side is the Chiayi Airport, on the north side is the Puzi River and on the south side is the Bazhang River. The distance from east to west of Chiayi City is 15.8 km (9.8 mi) and from north to south is 10.5 km (6.5 mi) with a total area of 60.0256 km2 (23.1760 sq mi). Chiayi City is completely surrounded by Chiayi County. Most of Chiayi City land are broad flat fertility plains. The terrain slowly rises from west to east. Chiayi City has a warm humid subtropical climate (Köppen Cwa). Northeasterly winds during fall and winter mean that rainfall is depressed during that time, while southwesterly winds during summer and the later portion of spring bring most of the year's rainfall, with more than 60% falling from June to August. Humidity is high year-round, even during winter. Huang Min-hui, the incumbent Mayor of Chiayi City. Chiayi City is a provincial city of Taiwan Province of the Republic of China. The city is governed by the Chiayi City Government, while the residence is represented in the Chiayi City Council. The current Mayor of Chiayi City is Huang Min-hui of the Kuomintang. 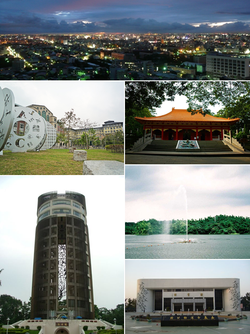 Chiayi City is divided into two districts. East District is the city seat which houses the Chiayi City Government. Chiayi City voted one Democratic Progressive Party legislator to be in the Legislative Yuan during the Taiwanese general election, 2016. Chiayi city is a 100% purely ethnic Hokkien inhabited city. On 17 December 2015, Chiayi City Government launched a program to set up solar panels at schools and offices in the city to reduce green house gases. The program is expected to produce 3.55 million kWh of electricity annually and to help reducing carbon emission by 1,700 tonnes. The spotted deer sculpture in the 228 National Memorial Park. Chiayi is the city of wind music in Taiwan. The wind music festival started as a local event in 1988, when it was more like a joint performance by local wind music bands. Over the years the festival has become the most anticipated annual event in Chiayi. Tan Ting-pho (1895-1947), Taiwan famous painter. Sow-Hsin Chen (1935), American physicist, Professor. Vincent Siew (1939), Taiwanese politician, Vice President of the Republic of China (2008 – 2012), Vice-Chairman of the Kuomintang. Deng Feng-Zhou (1949), Taiwanese poet, Local history writer, Nedan academics. Huang Min-hui (1959), former mayor of Chiayi City, vice chairperson of Kuomintang, a member of the Legislative Yuan (1999 and 2005). Lo Chen-Jung (1961), Taiwanese left-handed baseball pitcher. Wu Bai (1968), Taiwanese rock singer. Chiayi City is accessible from Chiayi Station and Jiabei Station of the Taiwan Railways Administration or a slightly further THSR Chiayi Station in Chiayi County. It also houses the first station for the Alishan Forest Railway. The Chiayi Bus Rapid Transit serves Chiayi City with the neighboring Chiayi County, and Chiayi City Bus serves the urban areas of Chiayi City. Chiayi City is served by Chiayi Airport located in the neighboring Chiayi County. ^ 《中華民國統計資訊網》縣市重要統計指標查詢系統網 (in Chinese). Retrieved 1 July 2016. ^ "嘉義市105年6月份人口統計資料". 嘉義市政府 (in Chinese). Retrieved 1 July 2016. ^ Campbell, William (1903). "Explanatory Notes". Formosa under the Dutch: described from contemporary records, with explanatory notes and a bibliography of the island. London: Kegan Paul. p. 549. OCLC 644323041. ^ Takekoshi, Yosaburō (1907). "Chapter XIII: Population and future development of the island resources". Japanese rule in Formosa. London, New York, Bombay and Calcutta: Longmans, Green, and co. p. 200. OCLC 753129. OL 6986981M. ^ "Statistics > Monthly Mean". Central Weather Bureau. ^ "2016 The 14th Presidential and Vice Presidential Election and The 9th Legislator Election". vote2016.cec.gov.tw. ^ "Chiayi City launches solar power system program - Society - FOCUS TAIWAN - CNA ENGLISH NEWS". Note: Hanyu Pinyin is the national standard now, but the defunct districts are named by Wade–Giles system when they got rescinded. This page was last edited on 24 March 2019, at 05:31 (UTC).